Whenever the lust for drugs, money, and power lays claim to a city, brutality is never far behind. Phoenix detective Veranda Cruz is dead set on taking down the Villalobos Cartel, but the ruthlessness of her quarry demands a ruthless edge of her own. Detective Veranda Cruz leads an elite task force on the Phoenix Police Drug Enforcement Bureau. Bartolo Villalobos is the heir apparent to the most powerful cartel in the world. No one in the department suspects the secret motive behind Veranda's obsession with the cartel . . . until an operation goes horribly wrong. Targeted by an increasingly unstable drug lord, Veranda must protect her family and stay clear of adversaries within the force while she sets a trap for Bartolo. As the desert action heats up, Veranda and her new Homicide team--along with an arson investigator who kindles a flame for her--are all drawn into a deadly gambit. Taking down Bartolo is the ultimate goal, but is Veranda ready to trade life for justice? Isabella Maldonado retired from law enforcement as a Commander of Special Investigations and Forensics. During her long career, she was recognized with a Meritorious Service Award and a Lifesaving Award, and she was selected to attend executive management training at the FBI's National Academy. Isabella is the immediate past president of the Phoenix chapter of Sisters In Crime. She lives in Mesa, Arizona. 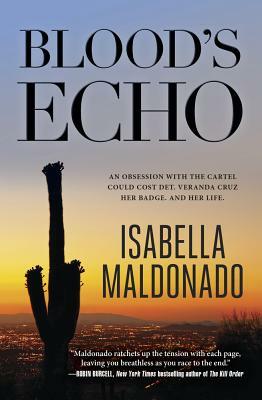 Isabella's first book, Blood's Echo, is a finalist for the Mariposa Award for Best First Novel!Isabella Maldonado retired from law enforcement as a Commander of Special Investigations and Forensics. During her long career, she was recognized with a Meritorious Service Award and a Lifesaving Award, and she was selected to attend executive management training at the FBI's National Academy. Isabella is the immediate past president of the Phoenix chapter of Sisters In Crime. She lives in Mesa, Arizona. Isabella's first book, Blood's Echo, is a winner of the Mariposa Award for Best First Novel!